Would you believe me if I told you my 7-year-old made this stunning piece of artwork with an apple? The whole thing actually came about by accident. It started when we went to the library and checked out the book "Apples, Apples, Apples" which features a bunny family that goes to an apple farm to pick apples. At the end of the book are crafts and recipes you can make with apples. First there was "cut the apple in half" to see a star. They all looked up at me like "WHAT?" So I went and got an apple, cut it open, and you should of heard the gasps when they saw the star in the middle (I just love those moments when you feel like "the Great OZ" and your kids think you are the smartest person they have ever met). 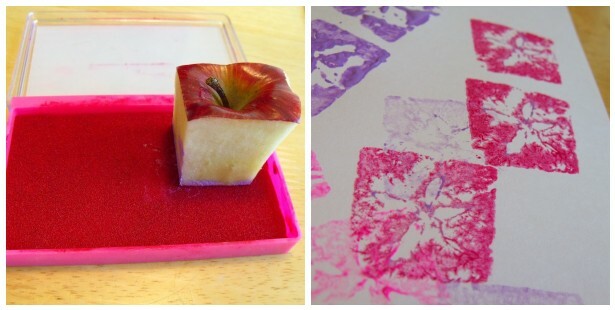 The next page had a craft using a squared off apple stem cut in half as a star stamper. I thought hey, this is how I cut apples anyway, now we can use the core for crafts! We thought we would try paint at first, but as it turns out, that was a bit too sloppy. The paint filled in the star shape and just made a runny square shape. After stamping a while it almost started to look like a star. 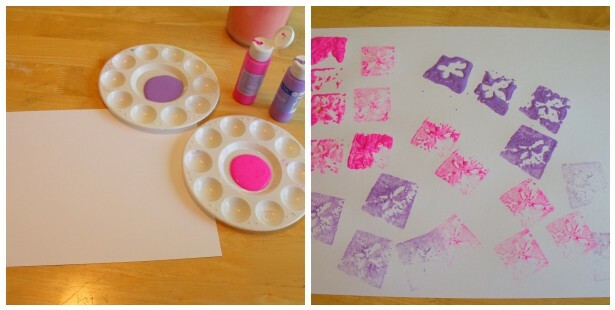 Then we decided to try a couple of old stamp pads we had lying around. Hey that worked much better! So then the next half hour was spent filling up blank white pages with multi colored flowers. Ok, a lot of blank white pages were filled up. But hey, they were having fun. Then, I notice my middle child had twisted her star stamp while she was pressing down, and it made a beautiful rose shape. That inspired me to do some mommy art of my own, I thought they it would look nice if a bunch of these little "roses" were in a vase. Ps. I'm no artist by the way, I just wanted to use up the left over paint we had tried in round one.